Nobody wants to see this card on a Monday–especially not me! We have enough life delays around here as it is. 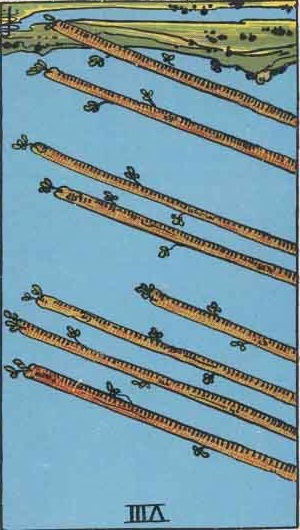 But here it is, the Eight of Wands, reversed. Our creative projects and deadlines, the stuff we’d like to be getting done as quickly as possible, are not exactly moving at top speed today. Instead, life keeps happening, throwing monkey wrenches into our plans. And in our frustration, we respond, either by rushing around like chickens with our heads cut off, getting nothing accomplished but wearing ourselves out, in an illustration of the old saying, “haste makes waste,” or, alternatively, we rush around procrastinating and getting distracted by other things because we are so anxious and apprehensive about the stuff that we aren’t getting done. Personally I am prone to the latter. On a day like this it is especially hard to take time to slow down and meditate or incorporate spiritual practices such as prayer into our routines, but, although those of you who this most applies to have not even made it this far down into the post, I feel I have to say that it is on a day such as this that we MOST need those practices. Take time to slow down and meditate if you can. Put the head back on your headless chicken–that can’t help but make your day go a little bit more smoothly, even if that reversed Eight of Wands energy is still lingering. You’ll be able to cope.